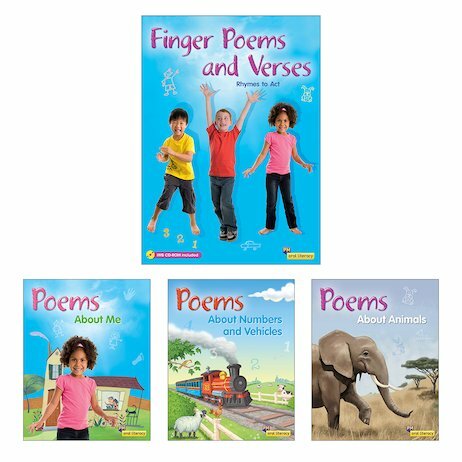 Children will love reciting and performing the finger poems & verses in this pack. The beautiful full-colour big book includes well-known and loved poems and rhymes such as ‘Incy, Wincy Spider’, ‘My Puppy’, ‘Five Little Monkeys’ and many more. Singing and reciting poems and verses is one of the important first steps in developing the oral literacy skills of young children. Poems and verses provide opportunities for children to hear the sounds of language in a rhythmical way while enhancing their phonemic awareness, understanding of patterns and exposing them to new words. The PM Finger Poems and Verses IWB DVD includes audio so children can listen and recite or sing along to their favourite poem. A bonus feature is the subtitled videos that show children performing the actions of each poem in the classroom. Teachers and children can watch the video to see the actions and then listen to the audio on the IWB DVD.